Meet up with a global community of cancer surgeons in the SSO HUB. “The HUB” is an interactive space organized by disease site offering networking lounges, mini-debates, case conversations, ePosters and team competitions. Watch the video. Did you miss a session at SSO 2019? Were you not able to make it to San Diego? 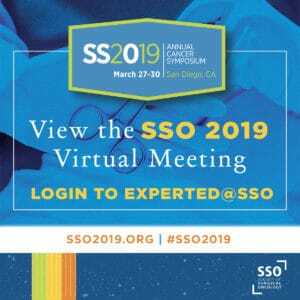 The SSO 2019 Virtual Meeting is a convenient way to refresh your knowledge with the latest leading-edge information. Login to ExpertED@SSO with your member credentials or create a free account. You may purchase the entire meeting or select sessions. The Virtual Meeting is available now. Keeping up-to-date with the multidisciplinary care of cancer patients can be challenging. Strengthen the skills of colleagues with the content of top scoring abstracts of SSO 2019 that are intensely reviewed by the SSO’s Scientific Program Committee and Disease Site Work Groups. Learn more about licensing opportunities.